Yes, we really do hear that question – a lot! Breast tissue needs support to keep it from becoming low hanging fruit. Some women seem to keep their perky 16 year old breasts and YAY for them. But most of the female population starts to sag at various stages of life. For me, I think it’s when I was in grade school or at least that’s how I remember it. 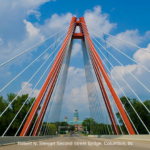 The bra was designed after suspension bridges. Now for those of you with an engineering mind, you get it. For me, I understand that it takes a lot of work for a bra to keep ‘these girls’ in the right place on my frame. Breast tissue is supported naturally by Cooper’s Ligaments. As these ligaments stretch over time, they aren’t able to provide the same support. Breast tissue should be in the middle of your arm between your shoulder and elbow. The support actually comes from the band of the bra, not the straps. If the band fits snugly around your torso and sits right where your breast tissue starts on your frame, you will have the support you need. The straps do a mere 10% of the work on the bra. Their job is to snuggle the cup to your breast. If your band doesn’t feel like a snug hug as compared to a wimpy touch, it will probably ride up your back which creates a teeter totter effect. The band rides up in the back and the breasts go down. The band should be snug enough that it sits level around your torso and horizontal to the ground. The straps are adjustable to make it comfortable for your body. A professional bra fitter can help address these factors to get you into the right fit and style for your body. The rest is up to your need and personal preference. And that is for another post. « Fun tip for Valentine’s Day – and EVERY Day!